In Scone Palace in Scotland there hangs a very unique painting. It shows a pair of late 18th century society women, Dido Elizabeth Belle Lindsay and Elizabeth Murray. What makes it unique is that one of them, Dido, is black. It is believed to be the first painting to show a black and white person as equals. This painting inspired filmmaker Amma Asante to tell the story of this little known mixed-race aristocrat. Dido is the illegitimate daughter of naval officer Sir John Lindsay and an African slave woman. While Lindsay loves his daughter, he must return to the sea, so he pleads with his uncle, Lord Chief Justice Mansfield, to honour Dido’s birthright and allow her to live under his roof. So Dido and her half-cousin Elizabeth grow up as surrogate daughters to Lord and Lady Mansfield. But Dido is caught between two worlds. She is too high in standing to dine with the servants, but too low to dine with her family and their guests. And what is to happen when she comes of age to marry? With little detail being known of the historical Dido’s life, screenwriter Misan Sagay has applied a fair amount of poetic license in Belle. The result is a film that is part society costume drama, and part historical courtroom drama. Alongside the Austen-like narrative of young women seeking husbands, is a secondary narrative which sees Lord Mansfield presiding over an important court case concerning the slave ship Zong. The Zong’s crew had been forced by a shortage of water to throw over 100 African slaves overboard on their way back to England, and are now seeking to recoup from their insurer for their lost ‘cargo.’ The case – an amalgamation of two separate cases Mansfield presided over – has potentially great consequences for a nation taking its first steps towards the abolition of slavery, and it provides a dramatic parallel to Dido’s own experiences. Lord Mansfield is a man who interprets the rules, lives by the rules and tries to do what is right within the framework of those rules. Dido challenges him to move beyond the rules in search of true justice. While issues of race are obviously foregrounded, one of Belle’s strengths as a film is that it explores oppression on a number of levels – race, class, gender. Upon the death of her father, Dido finds herself an heiress, an independently wealthy woman. On the other hand, Elizabeth, also illegitimate and not the Mansfields’ heir, has no money of her own. At a time where societal rules dictated that money should marry money, both girls have an advantage and a disadvantage. What is more important, bloodline or colour? What prejudice are people more willing to overlook? Belle explores this maze of societal conventions and hierarchies that Dido challenges on so many levels. Belle has all the trimmings of a well-made period drama. It has grand sets and intricate costumes, and they are all beautifully photographed. However, the Austen-like construct of its format does make it slightly predictable. There are no surprises to be had in the narrative here. 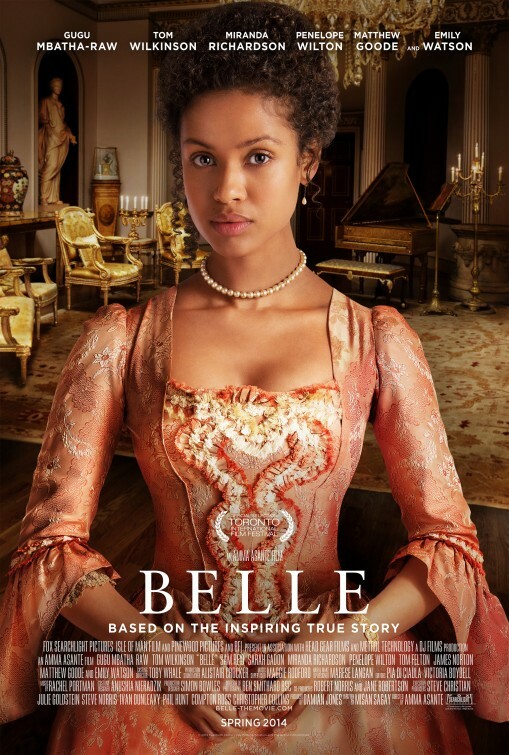 But engaging performances from Gugu Mbatha-Raw and the always excellent Tom Wilkinson, and a well organised exploration of social issues makes Belle well worth a look. Have you seen Belle? Leave a comment and let us know what you thought.